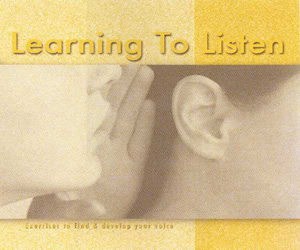 Learning to Listen is also available for instant download! Your whole life you've wanted to sing, but didn't dare, because…because…you've been told you can't hold a note…you've been told you're tone-deaf…you don't know if you can sing or not because you've never tried….because you never had the time…..voice lessons are too expensive…your sister (or brother) is the talented one in the family…what would you sing? Where would you sing? The world is full of singers who never made it "big"…(insert your own favorite excuse here). When you fall in love with the sound of your song, will you still refuse to hear the voice of your true heart; of your dreams and desires? When you appreciate the sound of your own voice, will you stay with those who tell you to "shut-up"?